Oh Kate, I just love these! I say go for it--get those pillow cases! Ha! I just bought that same bedding for my boys back in December. I posted pix of their bedroom on my blog. The bedding is super cute and soft. First of all congrats! I am going to the show on Thurs. random, I know. I saw this and loved it! From what I remember, I think everything received very good reviews online. How cute. Maybe I go get these for the guest room. Um...you've got me thinking. JUST LIKE THAT! Loveeee it so much! LOVE it! It would be cute in a pink and green version for girls! The two round pillows are SO GREAT! I totally want them for my living room - just because! Bedding from Land of Nod is so cute! You should totally get the life preserver throw pillow. Those are too cute!!! You def. need them!! This stuff is so cute. I especially love the Life Preserver Throw Pillow! What a great idea. The coast guard pillow is rockin' cute! My parents need one for the pool veranda...I'm going to email my mom the link. Hopefully she bites. 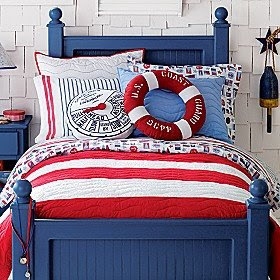 I LOVE the nautical bedding! I say get the life preserver pillow. We are lusting in our heart for those sheets. Seriously. That is so darn cute!!!! I ahdn't seen that!! !